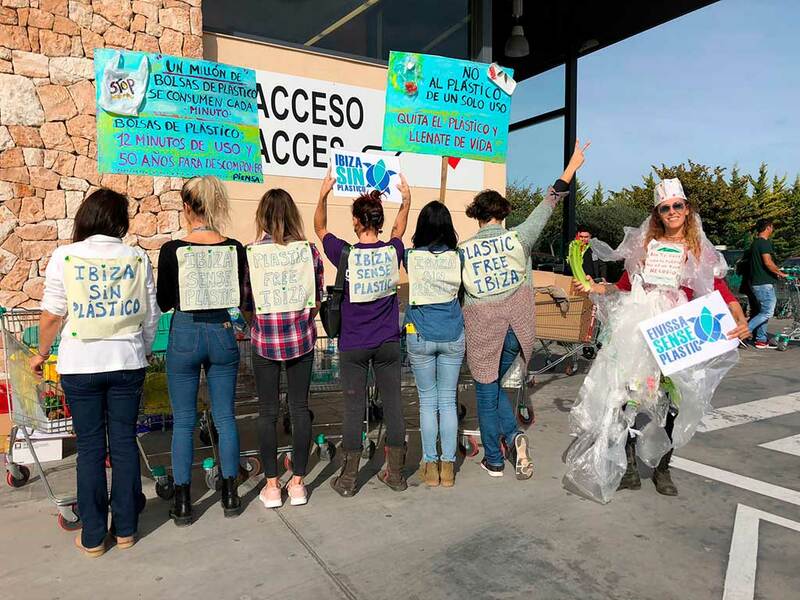 The new campaigning group Plastic Free Ibiza/Eivissa Sense Plastic staged a protest at Ibiza’s Puig den Valls Mercadona supermarket as part of their ongoing efforts to raise awareness and effect change in the issue of single use plastics used in food packaging. The gathering took place on 24th November and included participants of all ages with some families attending with their children. The organisers asked consumers to hand back the plastic packaging that had been obtained in store – which would then be returned to management of the Supermarket. In a statement issued by Plastic Free Ibiza, they cited Mercadona as the largest supermarket chain in Spain with 1,627 stores. “Mercadona can be the leader in the fight against plastic pollution removing plastic bags and excess packaging in all its stores”, they said. Drawing attention to the national problem they highlighted that Spain generated 1.5 million tons of packaging waste plastics in 2015. “Our seas and oceans are full of single use plastic. Ibiza is a small and beautiful island that we must take care of, and so we ask Mercadona to join in this movement”. This Is How Ibiza’s 20 Million Euros Tourist Tax Income Will Be Spent.